Ruthie Sommers, the talented Los Angeles-based interior designer, who graced the cover of domino magazine’s premiere issue, fuses an elegant and easygoing style while combining European antique and flea-market finds. Recognized by House Beautiful as among the top designers in America, and named as a rising design star in Southern California, Ruthie imbues an East-Coast-classic-meets-West-Coast-bohemian flair. 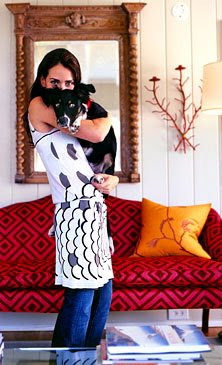 In 2002, she opened the Chapman Radcliff Home boutique in West Hollywood, a celebrity stomping ground for the design obsessed. Ruthie studied at Parsons in Paris, her work has appeared in House Beautiful, Traditional Homes, Coastal Living, Architectural Digest, Southern Accents, and Lucky. Oil painting, tennis, games (scrabble, charades, taboo, puzzles), skiing and gardening. Ruthie’s main interest is the environment. She is obsessed with waste and counts the amount of plastic she buys, composts and reuses all grey water. A complete sap for rescue animals of any kind, she visits the pound way too often. Ruthie has 3 pound dogs of her own and is a sucker for animal rights groups and saving the seals in the over polluted oceans. She is often told to lighten up about the environment, but find it a difficult task given that we need to give the earth that we borrowed back to our children.